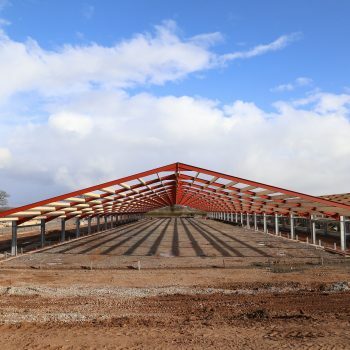 Shropshire farmer, Mike Harrison was already fully established within the arable and dairy farming world when he made the decision to diversify into poultry for the broiler market. 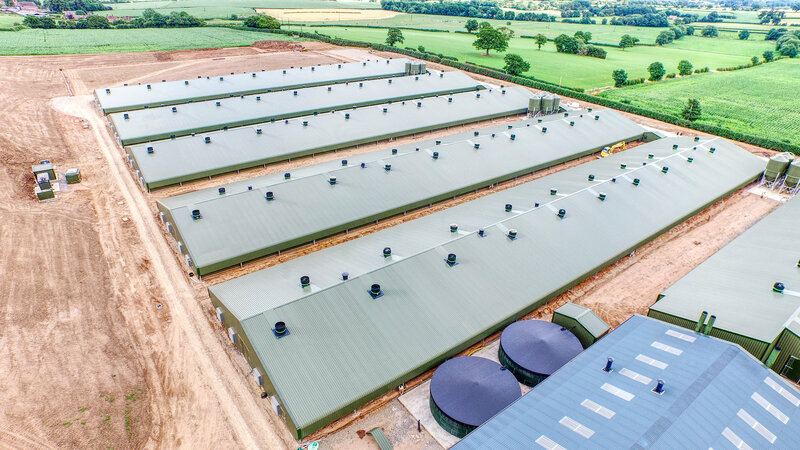 Having ambitious plans for a major poultry facility and during a five-year planning application period, Mr Harrison contacted Knights to discuss the project. 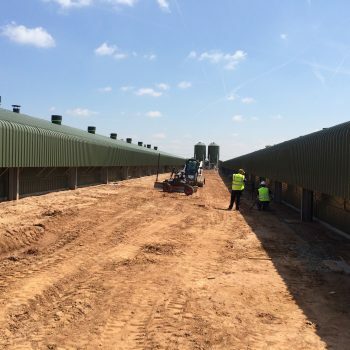 His planning included an application for the construction of six broiler units, an energy building to house three biomass boilers along with a classroom which would enable his newly-required staff to be kept at the forefront of the industry in terms of bio-security, welfare and technology. 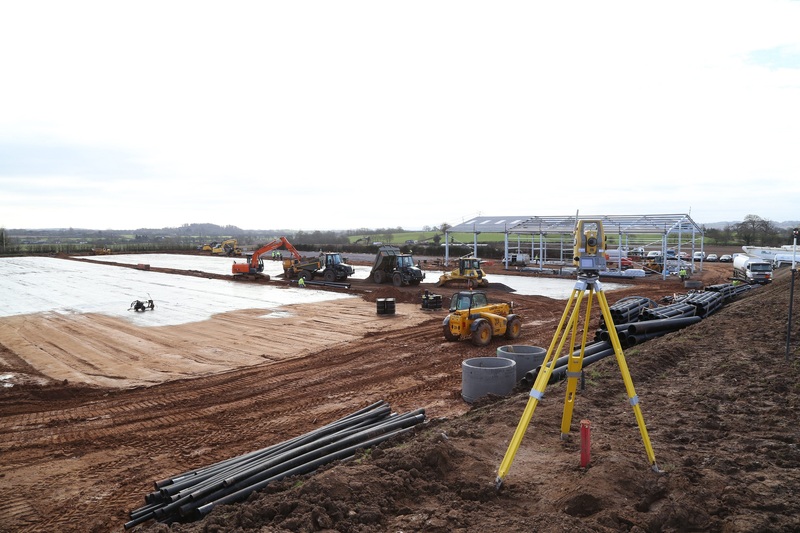 Prior to being awarded the contract, Knights’ engineers attended Mr. Harrison’s Vantage Farm to carry out topographical surveys which were later used for calculation and planning of the 60,000 cubic metres of earthworks that were required. 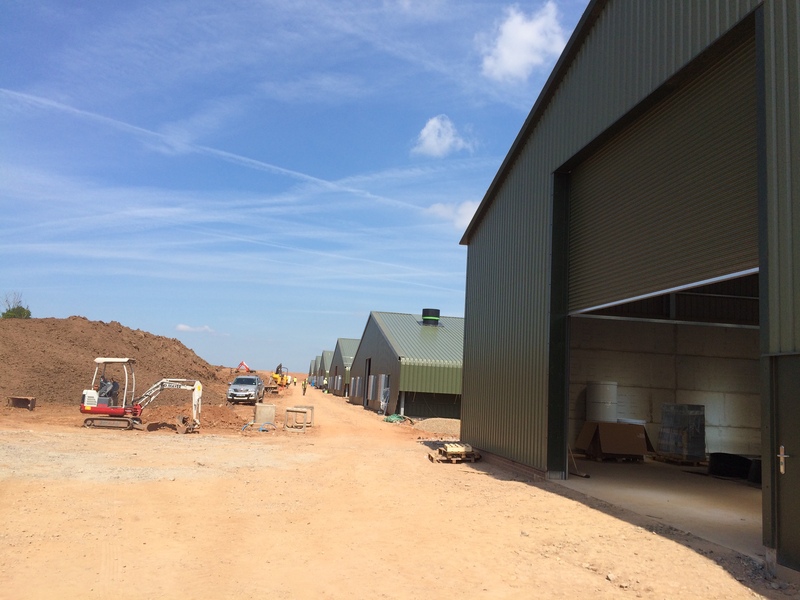 Knights Earthworks Division moved in to level the site but as an environmental stipulation, were also required to create sculpted bunds encompassing the site in a move designed to reduce the visual impact of the facility on the surrounding countryside. 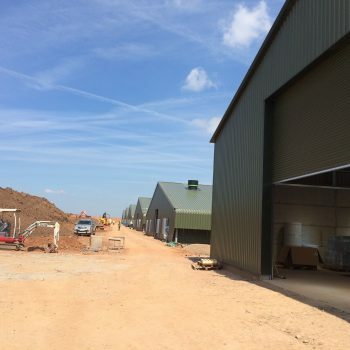 Due to the geographical location of the site and the ground conditions 18,000 square metres of ground was stabilised with a 30% CBR replacement layer of lime. This resulted in an 85% reduction in HGV deliveries that would otherwise have been required to bring in stone to the site. 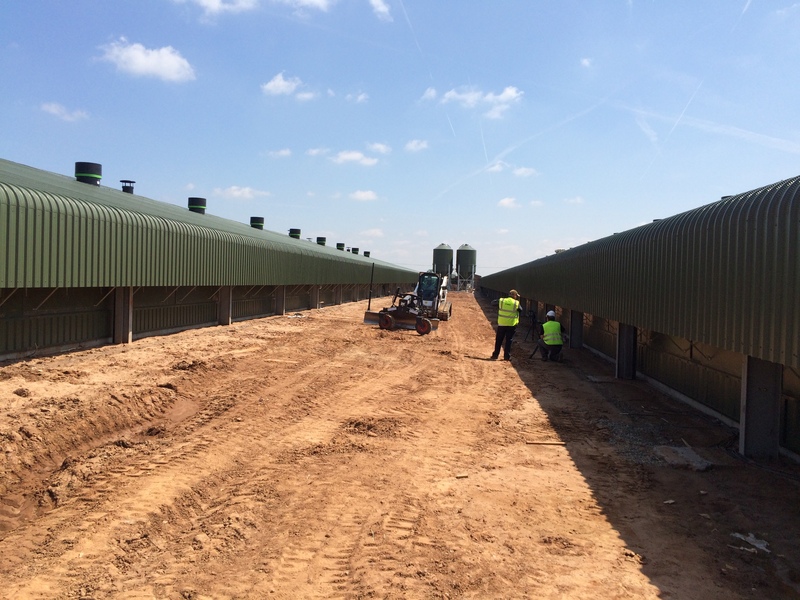 At the time this was the largest cementitous 30% capping layer replacement within the UK poultry industry.  Large scale civils was incorporated which included the laying of a total 3,050 metres of drainage, 5,500 metres of service ducts and 400 metres of steel heating pipe. 236 concrete stanchion pads made provision for the construction of the combined steel and timber-framed units which were supplied and erected by Powell’s. 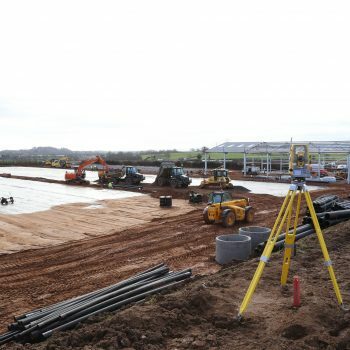 Formation of the 8,746 square metre external concrete aprons and access road along with the 19,542 square metres of internal flooring was carried out by Knights Concrete Flooring Division. The external areas were given a brush finish with the shed internal floors being power floated smooth to allow for easy wash out. 1,641 metres of concrete mass-filled walls were also formed in the control room areas of the units. IEC Solutions were behind the design and installation of the 3 x C995kW Ökotherm biomass boilers housed in the impressive new energy building which generates the entire site’s heat from green, renewable biomass energy. 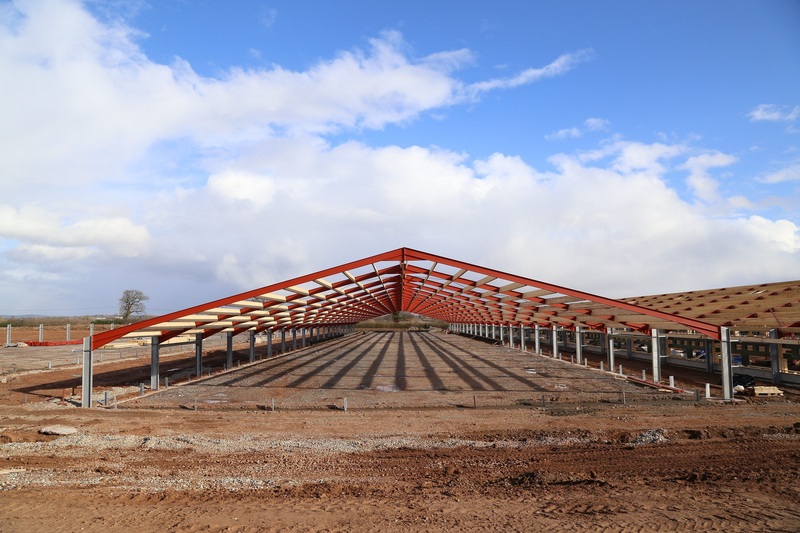 Completed in 273 days and ahead of schedule, Vantage Farm now boasts one of the largest poultry broiler facilities in the United Kingdom. 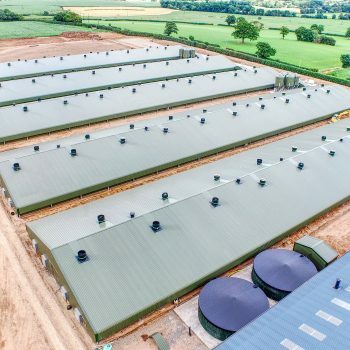 It has opened up a completely new venture for Mike Harrison and can house crops of over 300,000 broiler chickens which results in roughly 5,000 tonnes of meat a year.